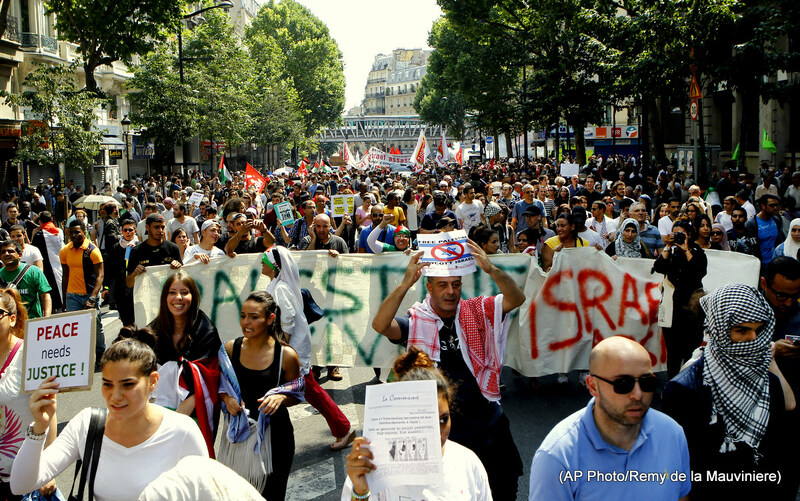 Pro-Palestinian demonstrators holding banners and chanting slogans walk in Paris, Saturday, July 19, 2014, to protest against the Israeli army’s shellings in the Gaza strip. This astonishing act of censorship happened only two days after the killings at Charlie Hebdo in January, but I hadn’t heard about it until now. Incredibly, not only did France’s interior minister ban Pro-Palestinian demonstrations, he assigned criminal penalties not only for those who participate in the rallies, but also those who publish details about these demonstrations on social media!!! France’s Socialist government provoked outrage today by becoming the first in the world to ban protests against Israeli action in Palestine. In what is viewed as an outrageous attack on democracy, Socialist Interior Minister Bernard Cazeneuve said mass demonstrations planned for the weekend should be halted. But Mr Cazeneuve fears there might be a repeat of the fights between ‘ultra’ Jewish vigilantes and pro-Palestinians which happened after a demonstration last Sunday. This can be increased to seven years and a 100,000 fine if the postings lead to violence. So, notwithstanding all the proclamations to the contrary, those who wish to silence us prevailed that day at Charlie Hebdo, only not as we expected. Instead of silencing the voices that spew hatred, racism, and bigotry, it gave the government license to silence all protests against it. Are the French people going to go along with this BS? I predict a large proportion of French activists will ignore the ban and protest anyway. They’re not meekly compliant the way Americans are. That’s the best way to get rid of bad laws. agreed. it is the best way to get rid of bad laws.